It's been two weeks since I posted a Tuesday Night Vego Challenge, so I was determined to post one today. We've switched all our white rice for brown and it's been a good decision. We're eating less and feeling better for it. 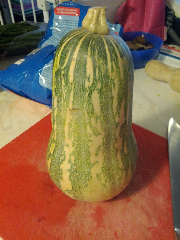 Tonight I'm using a Barbara pumpkin, which is a cross between a butternut and a jap (two of my favourite varieties). I've left some of the skin on for extra colour and goodness. Oozy Risotto with Brown Rice is possible! The creamy consistency of risotto comes from the starch of the rice, plus a good amount of butter and cheese added at the final stage of cooking. I've left out the butter, and the pumpkin adds to the sauce. The longer you leave this to cook, the creamier it will be - mine took about an hour. Stir, stir, stir! Heat the oil in a heavy bottomed pan over a medium heat. Add garlic and onion ans saute until the onion is soft. Add the rice and gently fry the rice for 3 minutes. Add the wine and cook until it has been absorbed. Continue cooking and stirring, adding spoonfuls of stock gradually. Halfway through the cooking, add the pumpkin, pepper and thyme. Stir the risotto often to tease out as much starch as possible. 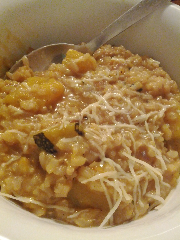 When the rice is cooked and the pumpkin is a little overcooked, stir through the cheese. Put the lid on the pot and take off the heat. Let the risotto sit for 5 minutes to rest before serving. Serve with an extra sprinkle of pecorino on top. I hate to say it, but this is screaming out for a Thermomix. I quite like making risotto, but with brown rice the self-stirring feature would be mighty nice. @L - I'm sure a thermomix would work wonders, and the pressure cooker might help it along too, but there is something very calming about stirring a pot of risotto (esp if you are drinking the same wine that went into it).